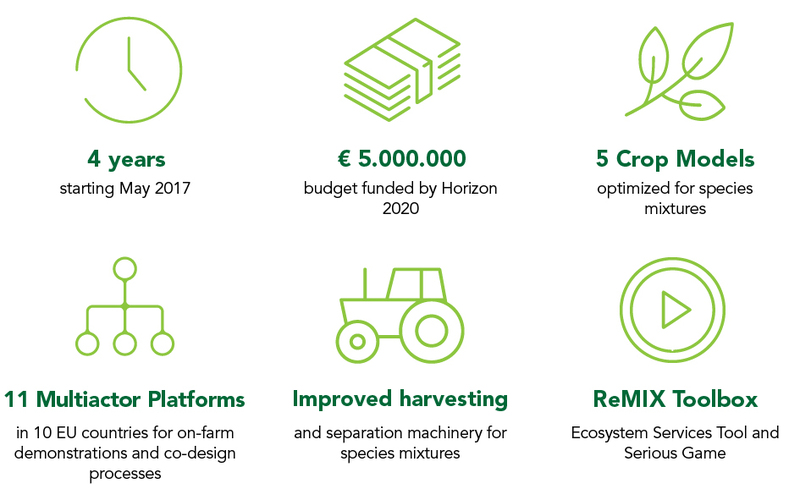 ReMIX is a H2020 multi-actor project that will allow designing cropping systems based on agro-ecology for the benefit of farmers and the whole EU agricultural community. ReMIX will exploit the benefits of species mixtures to design more diversified and resilient agro-ecological arable cropping systems. Based on a multi-actor approach, ReMIX will produce new knowledge that is both scientifically credible and socially valuable in conventional and organic agriculture. The project will tackle practical questions and co-design ready-to-use practical solutions. The project will span from the specification of end-user needs and the co-design of in-field and on-farm experiments to demonstrations with evaluation of new varieties and practices. ReMIX will contribute to the adoption of productive and resilient agricultural systems. Overcome barriers to stimulate the adoption of species mixtures by farmers and in agri-food chains. Unravel mechanisms of plant-plant interactions to maximize resource use efficiency. Determine the role of species mixtures in controlling diseases, pests and weeds and alleviating yield damages. Demonstrate the role of species mixtures in improving ecosystem service provision and development of resilience to biotic stress. Identify key traits and create novel breeding and phenotyping methods. Generate novel breeding material to grain legume / cereal mixtures. Develop generic rules for assembling species for efficient cash crop production using process-based simulation models. Develop new management techniques to optimize species mixtures performance. Optimize settings and specifications for agricultural machinery for harvesting and separating grains. Develop a toolbox, a serious game and technical booklets for farmers and advisors.